You are here: Home / Support the INVINCIBLE GUMBY team! Support the INVINCIBLE GUMBY team! On the 18th April (that is one month away!! 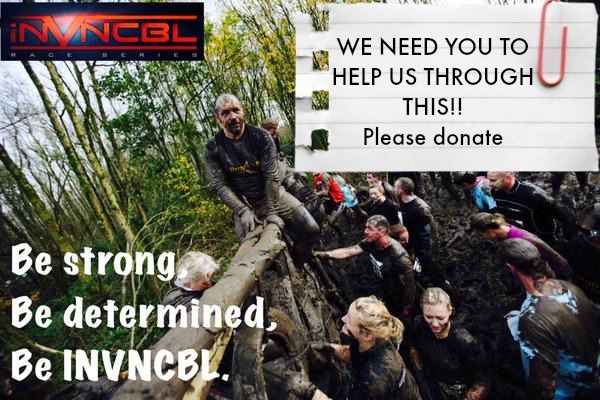 ), thirteen of us will BE INVNCBL! This might look like fun to some, hell to others and just plain daft to many more. For us, it’s a challenge to prove to ourselves that we CAN indeed do crazy, demandingly physical, hilariously muddy, miles out of our comfort zone things even though we all have doubts about our abilities. A mixture of ages, fitness levels, post – baby bodies and dirt level tolerance, we all have one thing in common – we want to raise money so that kids with additional needs can go surfing! Surfing is such an amazingly beneficial activity for everybody and you can read here to see why it’s a project that the Gumby Legacy has chosen to support. Thanks to some incredible support with fundraising so far, Gumby Legacy is really proud to have been able to fund two blocks of subsidised surfing sessions already, with ongoing blocks planned until the summer and our next big Surf’s Up event. As well as this, we have already been able to donate £2500 for Surfability to put towards the cost of purchasing a new vehicle. This will be such a useful asset as it means that more kids around South Wales will be able to access surfing lessons at their local beach and the first venue will be our very own local – Aberavon beach! The ‘bus’ will cost £5000 though so there’s quite a lot more fundraising to go. Thank you SOOOOOOOO much for your support. All of us are extremely grateful and it helps to keep us motivated and focused on training which, for the majority of us, is pretty hard going! If you are able to support us and are donating to support a particular member of our AMAZING team, please leave a comment below and/or on the donation page.